Concrete bollards are a protective guide for pedestrians and motorists alike, providing a stout restriction for vehicular traffic. Ensure community safety and security with these tall, understated concrete bollard. 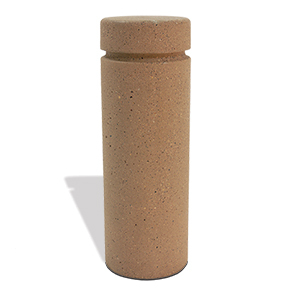 This 6-1/2' diameter concrete bollard is commonly used for both standalone and strategic grouping installations. Dually reinforced, this concrete bollard construction features 1/4" and 3/8" steel rebar—a big part of the heavy-duty durability and performance. This ASTM compliant bollard is available in a variety of standard and premium finishes to complement any facility.